Milan-born conductor Alceo Galliera (1910-1996) leads the Philharmonia through a swiftly operatic Tragic Overture. In fact it�s the fastest version I have ever heard. It comes as a shock to the system if you are used to Klemperer-like gravitas. It is most beautifully recorded and the 1956 stereo sounds remarkably well � in fact let�s not mince words: it�s superb! 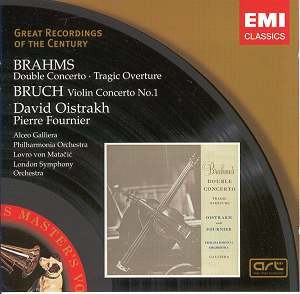 It�s a useful antidote to Brahms when you start to feel he has become grim in the hands of other conductors. At this speed Galliera sounds more like Muti putting the Schumann symphonies through their paces. Two years later came a characterful Double Concerto from Oistrakh and Fournier. The sound is full of ambient life and there is no zooming in on the soloists or if there is it is done with great taste. This is a sound middle of the road recommendation but the hairs on the back of my neck did not prickle in the way they do whenever I hear the Leonard Rose and Isaac Stern version (see review). There is a slight pop that should have been swotted at 1:31 in the finale. Otherwise the remastering is excellent. Masterful unanimity and sovereign tone from the orchestra. Like Galliera Lovro, Von Matačić (1899-1985) remains for many one of those peripherally known conductors who was energetically taken up by EMI in the 1950s and who also was paid court by Supraphon. He tackled opera including a lauded Merry Widow. He was also engaged for symphonies by Bruckner, Tchaikovsky and Balakirev. A popular accompanist-conductor he worked with Oistrakh in Prokofiev 1, Richter in Grieg-Schumann and Rabin in Glazunov.� This is another excellent version which for me really catches fire in the finale. It is there at 2.10 onwards in the orchestral tutti that we hear what these days might be called wilfulness from Von Matačić. A spate of quickly pumped up acceleration makes Bruch sound like Tchaikovsky � has Bruch ever sounded so fiery? There�s a luxuriously detailed and allusive note by Tully Potter. Fine revivals from the EMI stable and a pleasure to welcome them back.